As the push for more STEM (science, technology, engineering and math) education continues, many educators are turning to maker education. But, what exactly is maker education? Maker education is a type of project-based learning that relies on hands-on learning experiences. Within maker education, projects often focus on solving real problems students face and involve taking a project from concept to reality in order to demonstrate learning. Maker education allows teachers to create a range of hands-on projects, for beginners just learning the basics of circuits to advanced students creating an IoT project, that engage students in a variety of social and academic skills, meeting state standards and classroom objectives. Each project can be tailored to the needs of the class. Imagine an art project where students create an electronic light sculpture and then program designs to appear using a state standard for decimals, or a physics project where students build marble runs to explore light, or a history project where students create a map that lights up key locations and plays a recorded sound file to explain the events that took place there. In each of these activities, students are able to display understanding in more than one way, with organic, cross-curricular connections that may not happen in a more traditional setting. "By enabling a shift away from teacher-led, or even curriculum- ed, instruction, maker education is able to inspire a deeper form of learning. " This is why maker education matters. It opens doors for new methods of teaching and learning by combining a range of objectives into a single project. It allows the open-ended creation of a product that gives participants a choice in the execution and shows them that mastery can be demonstrated multiple ways both inside and outside the classroom. As shown above, maker education makes it easy to connect learning across disciplines in ways that may not happen in traditional classroom settings. Through these connections, students are encouraged to develop critical thinking and problem solving skills that will benefit them both in the classroom and in life after school. When students learn in a hands-on manner that engages them, they are more likely to remember what they have learned and more easily grasp deeper or more abstract concepts. Maker education can be used in a variety of ways and projects can be adjusted in scale or scope to meet individual class or student needs. The key to successful maker education implementation is finding project ideas that seamlessly integrate “making” into the lessons. "Give the pupils something to do, not something to learn; and the doing is of such a nature as to demand thinking; learning naturally results." Such projects can include designing and 3D printing maps of a geographical area of study, creating a light up demonstration of how the sun moves across the sky, or creating a sensor that reacts to noise levels in the classroom. The only real limit on project ideas is your imagination. As maker education becomes a more integrated part of classroom life, finding inspiration for project ideas becomes easier, you may even find that students are the best source of ideas based on what they are interested in learning more about. In the end, maker education is all about providing engaging experiences for students that brings out the best in them in the form of problem solving and determination. When adopting a Maker Education program,implementation planning is a critical factor in meeting academic expectations, achieving successful implementation, and validating funding decisions. Three key considerations are professional development, instructional/curriculum support, and selecting the right materials. Each of these pieces works together to culminate in an effective and engaging Maker Education program. iD Tech sees success with maker education. The key to properly implementing maker education is working with the end in mind, these tips can help. Things to consider include: “What will we achieve with this project?”, and “How can we use an authentic task to create ways for our students to show mastery of several standards so we do not compromise our timeline?” When maker education is looked at with the end in mind, all the necessary pieces will fall into place as plans are made. However, it is important to avoid mistakes that can make it difficult to ever feel ready to get started. To broaden the scope of maker education, or to implement it for the first time, educators should look to where they can truly redefine areas of a curriculum that need more engagement. Then comes the planning stage and deciding on an appropriate professional learning and support strategy. "When you create these exciting and engaging kind of lessons and projects, everybody gets excited about it, not just the kids that are motivated and want to get a good grade." Public focus on maker education often centers on flashy technology, but it is more than just that. Maker education is about building educational experiences that are based in the real world, that allow student choice, and that achieve multiple objectives. While crafting and monitoring these experiences may sound daunting, today’s educators are the beneficiaries of robust digital communities and experienced companies that recognize their products can be used to inspire and educate the next generation of inventors and world changers. In this vein, it is possible to find professional learning opportunities that meet your needs - from week long dives into the basics of teaching electronics to higher level technological literacy classes. Perhaps the most exciting thing about maker education today is that it is not only students who are being inspired, but also the very educators who are so critical to their development and future success. 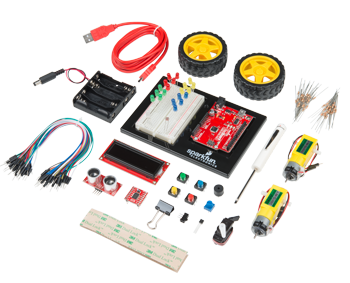 To get you started with maker education, SparkFun provides a large volume of instructional resources. From classroom downloads that explain the basics of different programming languages to concept videos on the basics of electricity and programming to project ideas both inspired and created by our educator community to a full semester curriculum for an introduction to design class, we are here to help. When getting started, it is important to select materials that can provide a wide range of flexibility and room for student growth. 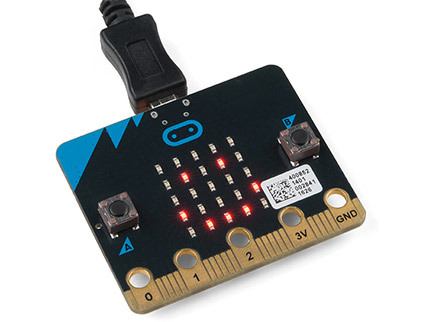 The micro:bit is a great board that can be used with either block-based or text-based programming and offers a multitude of options for expanding the basic board capabilities once users have progressed beyond them. The transition from block-based to text-based coding can be tricky, so being able to manage the whole process with one piece of hardware can make a huge difference. For more advanced students or projects, consider Arduino-based boards and kits such as the SparkFun Inventor’s Kit. Arduino-based boards allow students to create just about anything they can imagine and teach programming along with physical computing to make the overall experience more exciting and engaging. For those unsure where to start with Arduino, these basic steps will help. These are just two of the many options available to introduce students to the wonderful world of maker education. To help you choose the best option for your students and needs, it is helpful to know the difference between a microprocessor (such as Raspberry Pi) and a microcontroller (such as Arduino Uno) as well as the purpose of basic electronics components. Still not convinced that maker education is right for you? Don’t take our word for it. We surveyed a large group of educators to find out their thoughts on maker education. Turns out 94% of respondents believe maker education is vital to core curriculum.